"These yummy edible Christmas wreaths are made out of cucumbers, red, and green peppers filled with ranch dressing - a cute Christmas appetizer." Distribute cucumber slices on a platter and scrape out seeds from the middle, leaving a deep hole (but don't scrape all the way to the bottom). 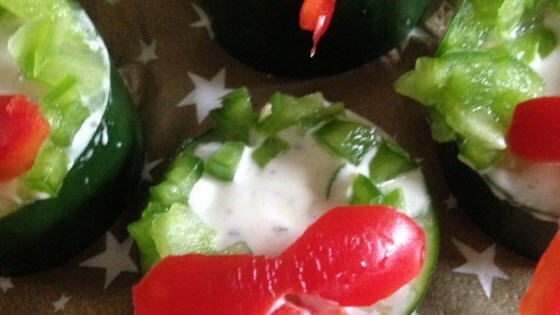 Fill hole with ranch dressing and spread a little on the rim, so bell pepper will stick. Distribute green bell pepper around the rim to look like a wreath, leaving one spot empty. Cut out small bow shapes (figure 8s) from the red pepper with a sharp knife and cut two thin strips for the ribbons. Place "wreath" on the cucumber slices. Watch how to make these easy, fun Christmas tree cupcakes.